A man who said he should not have to wear a helmet while riding a covered motorcycle has won his case in court. Peter Parker, 45, of Albany Road, Bedford, pleaded not guilty to three offences of riding without a crash helmet. 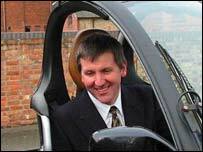 Magistrates agreed with Mr Parker that a motorcyclist rides inside a BMW C1, not on it, making a helmet unnecessary. Mr Parker said he was "pleasantly surprised" to be cleared. He said the decision "would prove to be a very important development in the world of motorcycling". The BMW C1 has a specially-designed cage for the rider, along with seat belts, roll bars, and a crumple zone. The £3,500 machine, with its 125cc engine, is capable of speeds of up to 73 mph. Mr Parker said: "I am a bit of an eco-warrior. "I was frustrated running my business around the town and I needed a means of transport that offered me the ability to get around town but not on a conventional bike." Mr Parker, an architect, told the court he did not like to ride his traditional motorcycle on workdays because he would not look professional in full leather kit and a crash helmet. 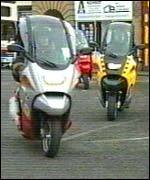 Under Section 185 of the 1988 Road Traffic Act, the BMW C1 is classed as a motorcycle, the court was told. Fourteen fellow C1 enthusiasts arrived at court with him for the hearing. None of them were wearing crash helmets.